VATICAN CITY (CNS) — Pope Francis will meet with U.S. President Barack Obama at the Vatican March 27, the White House announced and the Vatican confirmed. The spring meeting would be Obama’s second visit to the Vatican as president, but his first with Pope Francis, who was elected March 13, 2013. The White House said the Vatican visit would be part of a presidential trip to the Netherlands, Belgium and Italy. “The president looks forward to discussing with Pope Francis their shared commitment to fighting poverty and growing inequality,” said the Jan. 21 White House statement. During the same trip, Obama will participate in a summit in the Netherlands on nuclear security, visit the presidents of the European Council and the European Commission in Brussels, and hold talks in Rome with Italian President Giorgio Napolitano and Prime Minister Enrico Letta. Jesuit Father Federico Lombardi, Vatican spokesman, told reporters that Cardinal-designate Parolin and Kerry had discussed, among other subjects, “themes that have been the object of concern and discussion by the U.S. bishops,” particularly “the health care reform and its relationship to guarantees of religious freedom” — an apparent reference to the contraception mandate that has proven a major point of tension between the Obama administration and the church. In general, employers who provide health insurance to workers were required as of Jan. 1 to comply with a government mandate that those policies include various types of contraceptives, including sterilization and abortifacients. The penalty for noncompliance is potentially thousands of dollars daily in fines. Although the Obama administration has made some allowances for exemptions for religious institutions, when final rules were issued in June, some Catholic employers said the exception still did not address their moral objections. Obama met Pope Benedict XVI at the Vatican in July 2009. 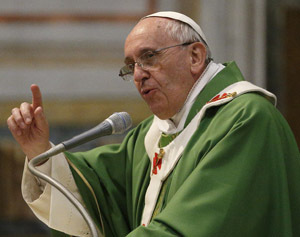 The pope gave the president a signed, leather-bound copy of his encyclical, “Caritas in Veritate” (“Charity in Truth”), and a copy of the 2008 instruction “Dignitas Personae” (“The Dignity of a Person”) on bioethics issued by the Congregation for the Doctrine of the Faith.